Here's a quick guide to help you choose a home theater system and complementary electronics for your room, based on room size. 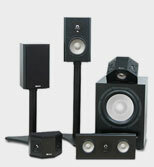 Having the right electronics and speakers for your room size will create a movie-like experience. For further details on each room, scroll down below the chart. 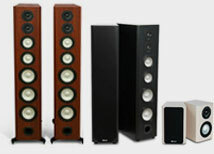 Pictured above, Axiom's Epic Grand Master Speaker Package in an In-Wall/On-Wall Configuration. Small: If your room is small, say, a den or a bedroom, of less than 1,500 cubic feet (a 10 x 12 x 8 foot room is 960 cubic feet), start by looking at the Epic Midi Home Theater Package. You'll also need an A/V receiver. The Denon AVR 1706 is a 7.1-channel model we like with this system. For even more features, consider the more powerful and versatile Sherwood Newcastle 771. If you don't already have a DVD player, look to the Panasonic DVD-F87 five-disc changer, or a universal upconverting DVD player by Oppo Digital. Your DVD player will also play CDs, so you can save room in your equipment rack by using one unit for both functions. Medium: Moving into a typical-sized living room, in a standard home or an apartment, 1,500 to 2,500 cubic feet (about 19x13x8 feet is 2,000 cubic feet), consider the Epic Grand Master Home Theater. With this Axiom system, the Sherwood Newcastle R-871 7.1-Channel Receiver with HDMI inputs is a great pick. It's a dual-zone 7.1-channel A/V receiver that will grow with your needs. 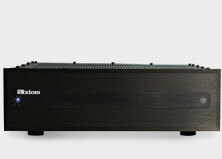 Like the Sherwood Newcastles, the Denons in this price range have robust amplifiers that will drive 4-ohm loads like the Axiom M80 v2 towers. For a step above the normal DVD player, look to Universal DVD players that play hi-res SACD and DVD-Audio discs as well as DVDs: we like the excellent Sherwood Newcastle SD-860 and the Oppo Digital 970HD or Pioneer DV-578A. Large: Finally, for large rooms or 'great' rooms with cathedral ceilings, the Epic 80 Home Theater Package or Epic 60 Home Theater will provide excellent movie-theater-like surround sound. Larger rooms need more amplifier power, so consider separates: the Sherwood-Newcastle A-965 7-Channel Amplifier will provide real-life volume and will drive 4-ohm loads like the Axiom M80 v2 towers with ease. You'd need to pair the A-965 with the P-965 AV processor. In all-in-one AV receivers, the very powerful Sherwood R-965 is an excellent choice, as are the Denon AVR-2807 or other Denon higher-end models. With this system, consider adding a Universal DVD Player with video upconversion, such as the Sherwood Newcastle SD-871, a universal DVD-V/ DVD-A/ SACD player with HDMI. 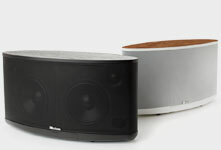 The Denon DVD-2910 is also a good choice. These will enhance standard DVD picture quality to almost-high-definition quality, so that your video image will be as excellent as your sound. Axiom has a variety of other speakers and subwoofers that you can choose to tweak your system to match your movie and music preferences exactly. Call one of our friendly, non-commissioned Home Theater Experts at 1-888-352-9466, or send them an e-mail. We're always happy to help!